Holy Cow, this is incredible!! 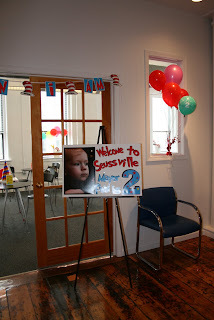 You totally rocked the Seuss Theme!! 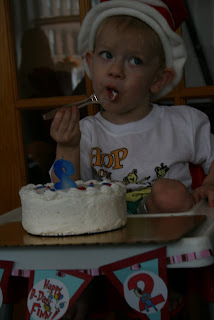 I'm going to have to start planning now for our little man's birthday next March... And I might steal some of your gems! Do you party plan for a living? Everything I've seen from you is utterly fantastic. 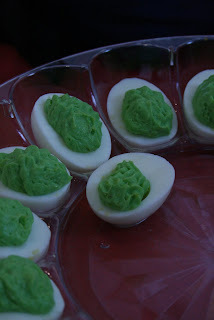 I will be picking your brain this summer for Stella's 2nd bday and again in two years when the hubs turns 30. 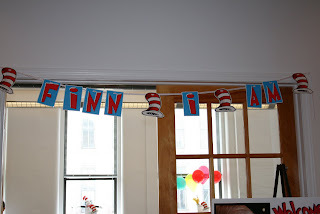 I just wanted to let you know that I have been looking everywhere for ideas for my son's Dr Seuss 1st birthday party. I had a ton of ideas, but I was really having a hard time with the menu. After searching through 7 google pages (and clicking on almost every one), I FINALLY found your site. 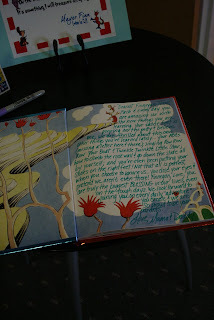 I hope you don't mind, but I'm copying your menu, and the idea with the "Happy Birthday to You" book is awesome. You did an amazing job & I hope our party turns out half as good! Thank you for sharing! Jameson's Mama, I was going to send you an email back but you have your email disabled in blogger. You're more than welcome to steal the menu & thank you for the compliments! 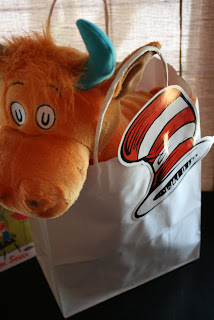 Plus, I was JUST in Kohl's a couple days ago and they have the Seuss characters again so head over there and pick up the $5 stuffed animals! And stop back to leave me a comment so I can see your party. 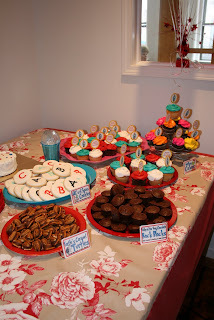 oh my goodness what a fun party! i'm in the same boat as jamesons mama. 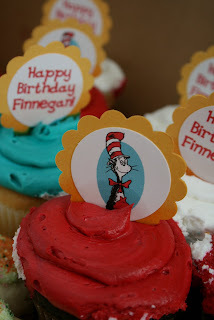 my sons first birthday is at the end of the month, seuss theme, been googling for MONTHS and came across yours today. i love everything you did! 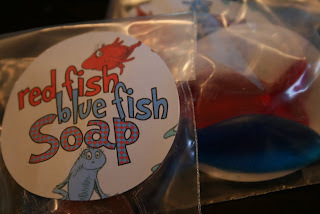 thank you for sharing your genius ideas with the world :) i'll be heading to kohls later today ;) and i'm hoping to order the fish soap, if my hubby doesn't they're silly, lol. you wouldn't happen to have the soap tags available for purchase do you? and the hat tags for the bags, are those from oriental trading? i came across those earlier today in my search. email me katydi21 at hotmail dot com. thank you! 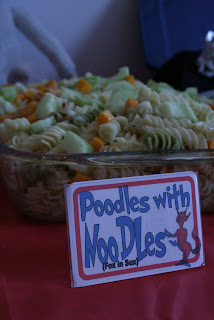 Kathryn, Costco also now has the Seuss book packs again! 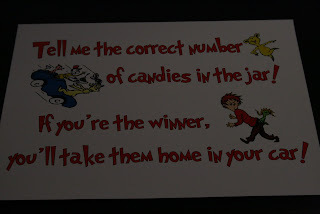 I was planning on doing those and wrapping them individually for the kids favors. It would cost out at much less per child if you want a less costly alternative. Thank you so much! I just ordered the books & I'm going to try to get to Kohl's tomorrow! By the way, my email address is jamesons_mama@yahoo.com I couldn't figure out how to add it. cute. cute. cute. 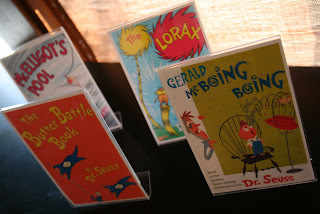 seussical birthday! 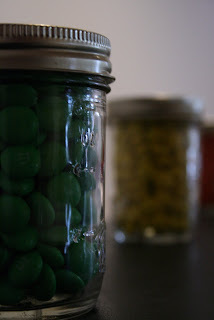 you are a creative mama...i love it all. 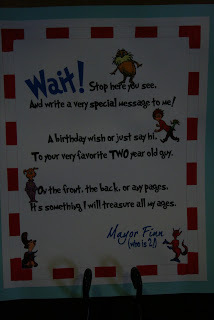 i really like the poem that invites the guests to sign the Happy Birthday book...that is fabulous!